China’s fine art traditions, practices, and imagery can be linked to each significant political moment of its history, reflecting and responding to the mainstream political ideology, expectations, and academic discourse of the time. The exhibition Dong Yifang: Painting Through a Century of Change in China explores this connection through a visual survey of the life’s work of Chinese ink painter Dong Yifang as he finds his artistic voice through three distinct periods of Chinese history. Dong Yifang (1925-2006) is one of few Chinese artists who worked continuously through the periods of the Republic of China (1911-1949), High Socialism (1949-1976), and Reform (1977-present). Dong began his artistic practice in the 1930s by developing a solid foundation in traditional Chinese painting through his studies with teacher and painter Qin Zhongwen (1896-1974). At the Beijing College of Art, from 1942-1945, Dong learned oil painting from Wei Tianlin (1898-1977), an impressionist who had studied in Japan. 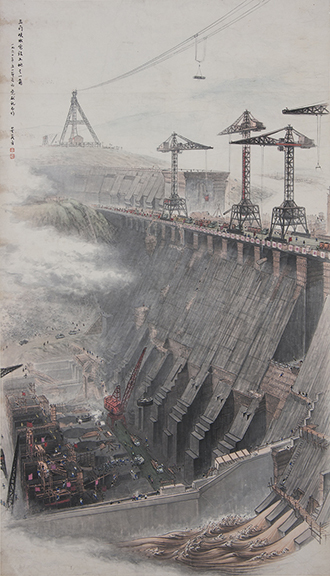 In 1946, Dong studied watercolor painting at Fu Jen University and worked with Gustav Ecke at Beijing College of Art. Through these experiences, Dong Yifang became skilled in both Western and traditional Chinese painting techniques. Early in his career, Dong’s work reflected his studies and understanding of traditional artistic practices; his paintings also revealed a love for the landscape. During the period of High Socialism, Dong struggled with the limitations that resulted from the politicization of art, as socialist realism became the official art style of the People’s Republic of China. Finally, during the period of Reform (1977-present), modern Western art was reintroduced, and Dong Yifang found the freedom he needed to continue his artistic development. In the 1990s, Dong established a method of painting by building upon the techniques of traditional Chinese ink painting and incorporating Western-influenced naturalism. His final works reveal not only a unique understanding of material, light, space, and form, but a thought-provoking commentary on the artist’s never-ending search for mastery of craft and originality of voice within a world of political and social change. Dong Yifang: Painting Through a Century of Change in China will feature ink paintings and sketches by Dong Yifang, supplemented by original art work of Dong’s teachers, colleagues, and students: Qin Zhongwen (1896-1974), Lu Yanshao (1909-1993), Song Wenzhi (1919-2000), Wei Tianlin (1898-1977), and Wang Yani (b. 1975).